I've started using a lot of new products recently so thought I would do a "What's on my face" style post as I haven't done one in a while, well, I haven't blogged regularly for ages but we'll skim past that.. My new favourite foundation is Mac Studio Fix Fluid, I have done a full review here so you can read my thoughts on it in full. I absolutely love this foundation, it checks every box in terms of the perfect foundation for me: High coverage, long lasting, good range of shades and covers redness/scarring/blemishes. I have the shade NC15 which matches my skin exactly, this is a very rare occurrence when it comes to foundations as they NEVER match my skin and I always end up with an obvious foundation line. Under my eyes I use the Bobbi Brown Creamy Concealer, this stuff just doesn't seem to finish, I've had it for so long! As the name suggests, it's so creamy and not drying under the eyes, it covers all my dark circles but doesn't crease or look heavy. 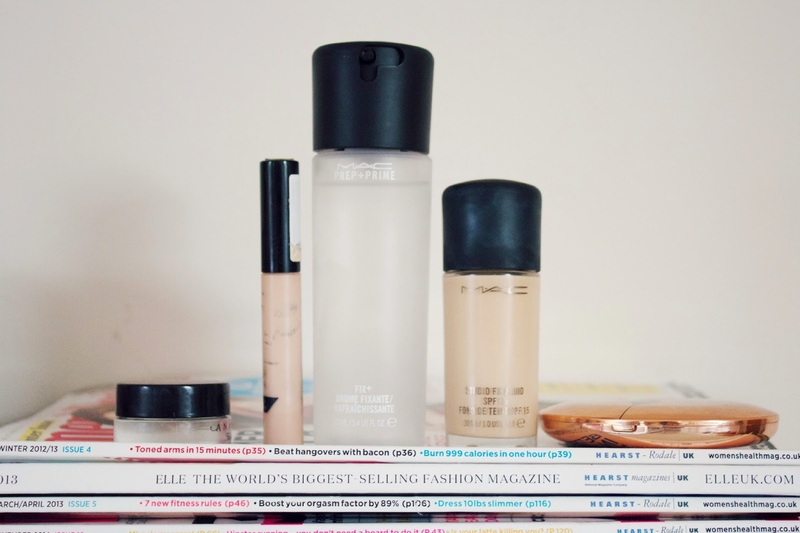 For blemishes I use the Collection Lasting Perfection concealer, when it's in stock I also use the Nars Radiant Creamy Concealer but I can never get hold of my shade! The Collection one is brilliant and so so affordable! For powder I've been using the Charlotte Tilbury Airbrush Flawless Finish Powder, I bought a few things from Charlotte Tilbury and this was probably my favourite, (if I'm being honest, I was slightly disappointed with the items I purchased. Reviews coming soon..) it is very finely milled so it is a really lovely powder, although very very very very expensive. I then set my makeup by spritzing Mac Fix+ all over my face, this smells lovely and it's such a brilliant product! For my brows, Anastasia Beverly Hills is the queen. I would recommend both Brow Wiz and Dip Brow Pomade as they are both amazing products and by far the best products for brows, in my opinion. I currently use the Dip Brow with the Large Synthetic Brush (number 12 I think) also from Anastasia. On my eyes, I have recently started using my Mac eyeshadows again, I still think Mac eyeshadows are my favourite, I start with All That Glitters over the lid, Omega in my crease and a mixture of Mulch and Woodwinked on the outer corner, those all together are so pretty! 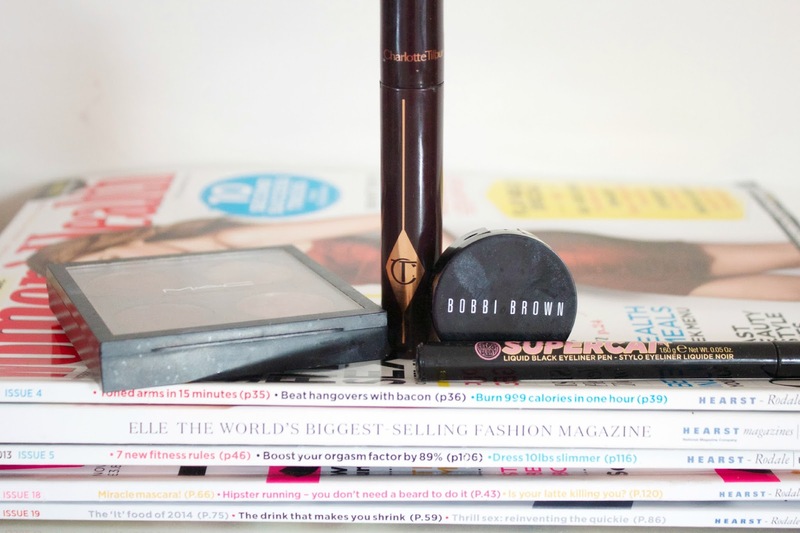 I then apply the Soap and Glory Supercat Liquid Liner and finish with the Charlotte Tilbury Full Fat Lashes Mascara which is very good, although it has dried out very quickly! I haven't used my mac fix+ in forever! You've prompted me to brush the dust off and start using it again!